In the very early days of the 1989 Chinese student movement, among the first things the students did was to "disband" their official student union by massive demand. In Peking University, this happened in the evening of April 19. The official student union, if not officially dissolved, became defunct since then. Nobody had paid any attention to them until now, 25 years later, when New York Times published a profile of the head of that union in Peking University at the time: Xiao Jianhua. There was no public mention then — and there have been very few mentions since — of the head of the official student union of Peking University at that time. His name is Xiao Jianhua. Mr. Xiao never opposed the government, and the events of June 1989 did not make him one of China’s “most wanted.” Instead, they catapulted him into the ranks of its most wealthy. After a tepid attempt to represent fellow students to university administrators that volatile spring, Mr. Xiao shifted course, agreeing with administrators that street protests had become out of hand. People who knew him at the time said he even worked with them to try to defuse the protests before Chinese troops descended on Beijing and crushed them with force. The rewards were immediate. Just after he graduated, Mr. Xiao stepped into the world of business with direct financial support from Peking University, one of China’s most prestigious institutes. In the quarter-century since, he became the prototype of the politically connected financier. He has assiduously courted the party elite, including the family of its current president, Xi Jinping, becoming something of a banker for the ruling class and a billionaire in his own right. Now 42 years old, Mr. Xiao controls a sprawling business empire with interests largely in state-dominated industries, including banking, insurance, coal, cement, property and even rare-earth minerals, and largely managed by his holding company, the Tomorrow Group. 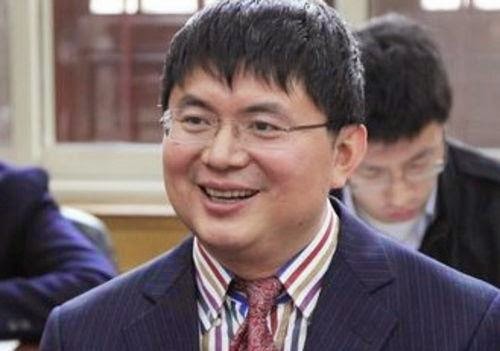 It goes on to claim that Xiao Jianhua's personal fortune is now estimated at $2 billion and speculate and imply that much of it came through official connections and corruption. Through a spokesperson of the Tomorrow Group, Xiao Jianhua issued an immediate response. While agreeing that he, as an 18 years old at the time, had grown disillusioned with student protests and politics and retreated to study in library rather than participating in the movement, he strongly denied any "rewards" of his actions, or the lack thereof. His riches, he claimed, are the result of legitimate and hard-working efforts, following the example of the famed American investor Warren Buffet. Zhou Fengsuo (周锋锁), a former 1989 student leader, managed to sneak into China at the 25th anniversary. 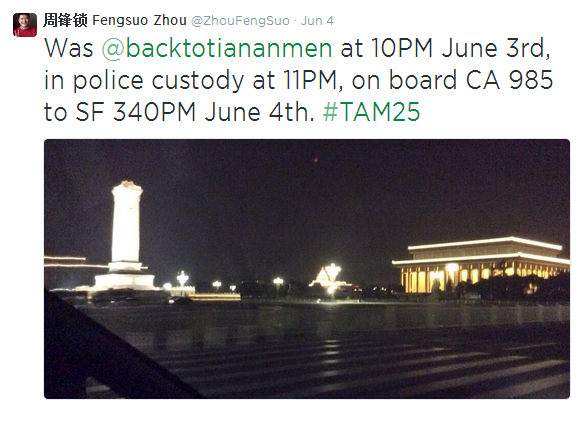 He paid a brief visit to the Tiananmen Square before being detained and deported. In 1989, Zhou Fengsuo was heavily involved in the works with the Beijing Students Autonomous Federation as a representative from his Tsinghua University. That landed him on the fifth spot in the 21 Most Wanted list. After the massacre, he was arrested and jailed for a year, but was never formally charged or sentenced. The arrest and release should have technically cleared his "wanted" status. According to his interview with the New York Times, Zhou Fengsuo now holds an American passport and has already had two previous, low-profile visits to China in recent years. Among the 21 Most Wanted, so far only Li Lu was able to visit China without consequences, albeit under a specially arranged circumstance.